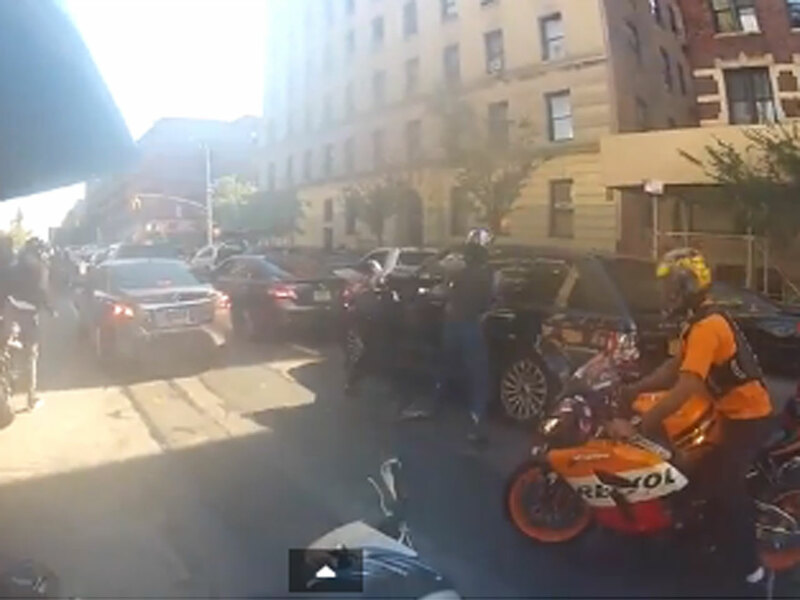 (CBS) NEW YORK - A video posted online shows a disturbing confrontation that took place Sunday in New York City between the driver of an SUV and a group of motorcyclists who surrounded the SUV on the highway and used a helmet to bash the driver's side window, reports CBS New York. The video, which was posted on YouTube Monday morning and appears to be taken from a camera mounted on one of the biker's helmets, shows what appears to be dozens of bikers speeding up to a Range Rover on the West Side Highway in Manhattan. Police told CBS New York's radio affiliate 1010 WINS the driver of the SUV, a 33-year-old man, had his wife and daughter inside the car at the time. It is unclear what sparked the confrontation. In the video, one of the bikers can be seen looking at the driver of the SUV before pulling in front of the car and slowing down. Eventually, all of the bikes come to a complete stop on the highway, forcing the SUV to hit its brakes. That's when an unidentified biker can be seen getting off his bike and walking towards the Range Rover as the other motorcyclists look on. Around the 50-second mark, the SUV hits the gas, running over at least one bike before speeding off. For the next couple of minutes in the video, the bikers are seen chasing the Range Rover through Manhattan until about the 4:50 mark when traffic forces the SUV to slow down. That's when a biker can be seen running up to the SUV and yanking open the driver's side door as the driver of the Range Rover again guns the engine in an attempt to get away, hitting another bike as it speeds off. The bikers give chase again as the Range Rover heads into Washington Heights. The video ends when the SUV again gets stuck in traffic. The group of bikers can be seen surrounding the Range Rover and one of the riders jumps off his bike, ripping off his helmet and using it to bash in the driver's side window. A second biker can also be seen running up and hitting the driver's side passenger window with his fists. According to the user who posted the video online, the bikers were participating in an annual street ride in the city at the time of the incident, reports the station. The SUV's driver had called 911 to report the bikers were driving erratically, police said. The driver of the Range Rover was injured and taken to the hospital, police said. It's unclear if any of the bikers were also hurt. The incident remains under investigation and no arrests have been made thus far, a spokesperson for the NYPD told CBS News' Crimesider.